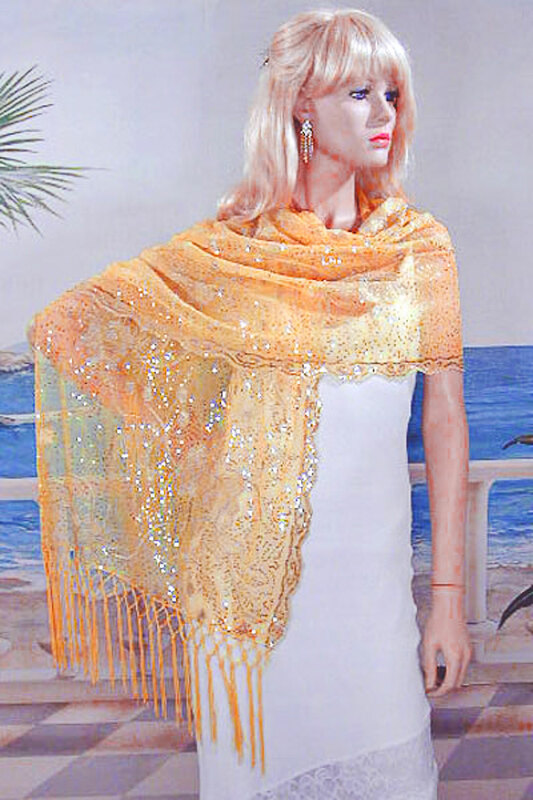 Sheer sequined Embroidered Oblong Shawl Wrap Sheer sequined embroidered oblong shawl with fringe ends. The sequined design may vary but the overall look is the same. This elegant wrap is the perfect accessory for dressy and formal occasions. The fabric is tulle and the design extends over the entire shawl. The sequins match the embroidery and add sparkle to the design. The long edges are scalloped and the ends have a knotted fringe at the hem. There is a wide selections of colors and shades available so you should be able to match or complement your evening dress. Perfect for proms and dressy evening events. Color: gold Hue: Code: #FFD633.